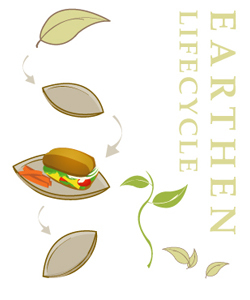 Earthen Trading is a young sustainable company with a mission to introduce truly earth-friendly products into the mainstream consumer market. Our products offer food servers in North America a great tableware alternative to reduce their environmental footprint and promote the zero-waste goal. With a focus on the principles of sustainable business,we hope to help minimize impact of on the planet and its people. Our vision is to establish ourselves as a leading wholesaler of eco-friendly products in North America. Vancouver based Earthen Trading Company Inc. (ETCI) was founded and incorporated in Victoria, British Columbia in 2007 by 25 year old Alex Casewa. It is a young sustainable company that imports biodegradable disposable dinnerware branded “Earthen” made from fallen palm leaves. Our goal is to create a business which is based completely on sustainable business principles implying service to the planet and in turn service to its people. This explains our moto – “One Planet. One Home”. Earthen disposable dinnerware is a unique and innovative concept to the Canadian market and in its product category. Our customers consist of those with high regard for the environment and for fair practices. “This business arose from a thesis project for a Sustainable Development class while I was in Business school. It is of utmost importance and my personal goal that through this business I contribute toward a positive environmental and social change.” – Alex Casewa (CEO & Founder). We are sincerely committed to the environment and the community which we live and work in. Being a sustainable company enables us the leverage to attain our vision and mission, and this we would like to achieve in the most efficient and honorable manner. We ensure that the raw material is purchased at fare rates giving the farmers an additional income from their waste leaves. Employees are paid above minimum wages making medical and educational facilities more affordable. Our packaging is made of oxo-biodegradable film rather that PET plastic making our products zero-waste. We also sponsor events that support causes such as raising money for medical facilities in Africa, promoting organic buying and eco-fashion, and providing products for seniors in the community.